We got a new foster pup recently from the Indianapolis Humane Society and he's such a quiet lad compared to the beagles; admittedly that is setting the bar a bit low. We're thinking that he's some kind of border collie/chow/lab mix. He's definitely got a chow-ish head, but he's also been trying to herd the beagles, which is pretty amusing to watch. 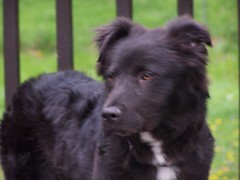 Updates on his behavior and socialization are coming up regularly on 'his' posts at indypaws.com. The lad does not like the Roomba, but loves getting baths. Any ideas as to what kind of dog this might be? Comment if you know. I'm reading: New foster pup: Bowie IITweet this! Bowie was adopted by a wonderful family and is becoming fast friends with the boy of the household. Thanks for your emails and support during his foster time! More info on Bowie is available at Indypaws.